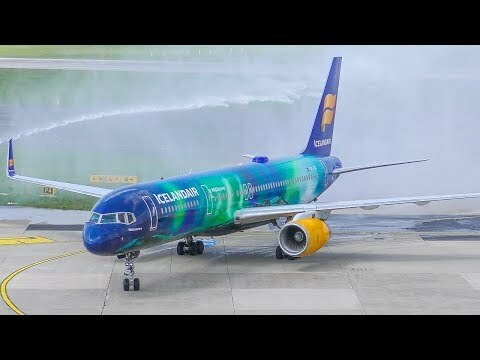 This Boeing 757 of Icelandair received a water canon salute at Düsseldorf Airport yesterday. It was the first flight of Icelandair at Düsseldorf and they intend to connect Düsseldorf with Keflavik twice a week. Actually the route was planned with a Boeing 737 Max, but since the Max is grounded Iceland had to adjust its flightplans. They will subcharter three Boeing 767s for the summer season. It` s almost a tradition to welcome a new company with a water canon salute. Icelandair was welcomed by the fire brigade and its always a fantastic motive for us videographers. Special thanks to Icelandair for sending the beautiful Hekla Aurora logo jet. What a fantastic looking livery!